Host a Picture Book Study & Tournament! Confession Time: During first semester I had a lot of 8th grade students who abandoned books on a regular basis regardless of how many book talks and read alouds I planned. As we got closer to Thanksgiving, I knew I needed a plan to really create an environment of positive reading experiences immediately or I might lose them for good. I thought that if I could supply them with great books that they could finish quickly, it might boost their reading confidence levels, and thus, our first picture book tournament was born. We held our picture book tournament between Thanksgiving and Winter Break and it was a multi step event where students continually hit all of our daily reading goals in room 213: 1. read texts, 2. talk about texts, 3. write about texts and 4. listen to a fluent reader. It was one of my very favorite things I have done during my teaching career and I highly encourage you to try it! Here’s a step by step walkthrough of how I undertook this project. I’m certainly not the first teacher to have a book tournament, so I encourage you to seek additional sites and resources if you are unsure how to approach this activity. 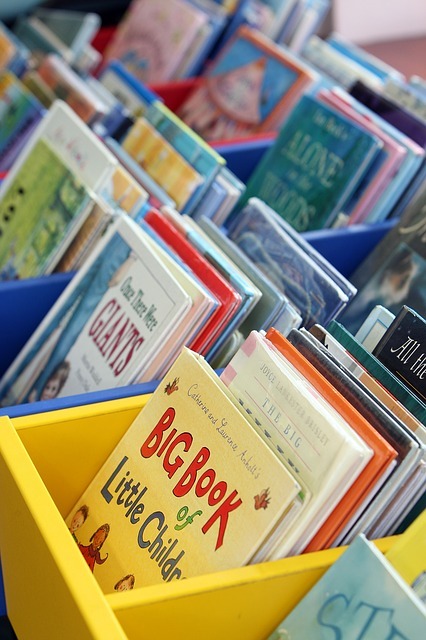 Step 1: Select and gather books – I wanted to get a variety of picture books from the same authors so that students weren’t just exposed to random picture books, but to an author’s collection of books. They were able to study authors’ and illustrators’ styles much more in depth this way. The authors/illustrators used: Mo Willems, Dan Santat, Oliver Jeffers, Peter Brown, Chris Van Allsburg, and Jon Klassen. There were 36 books total for students to select from. Step 2: Figure out what you want students to learn and do – I wanted students to 1. be exposed to a lot of quality books and have a good time reading them 2. to acknowledge and study characters and plot, 3. to appreciate the text and pick out their favorite lines while citing them correctly and lastly 4. I wanted them to be critical and rate each book. Additionally, I wanted students to start talking about these texts, but knew that once we got going this part would be inevitable. Students were invited to read at least 20 picture books from the collection. Some read less and some read more, but the majority read right around 20 on their own. I also read a few aloud for modeling purposes and to encourage talking about text. 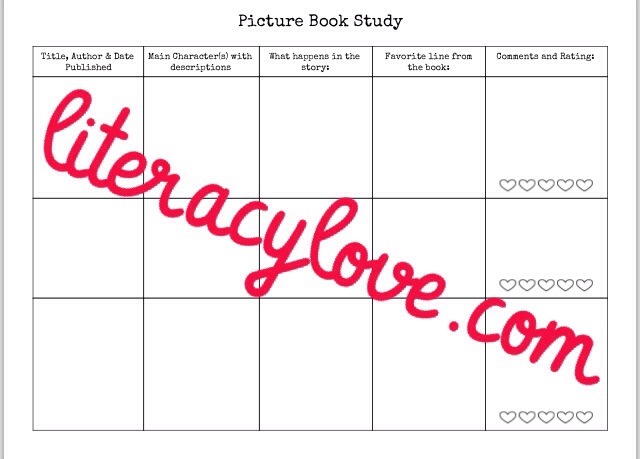 Step 3: Picture Book Study Form – Students used the form below to capture their thoughts about each book. I copied it on large paper so they had more room to write. Step 4: Complete study and tally results – Students were given several days to finish this study in class. As time when on they looked forward to selecting books from the cart and this was not a quiet activity. While students were respectful of others while reading, there was also a lot of “Hey, you should read this one!” and “This one is my favorite so far”. Students started figuring out who their favorite authors and illustrators were and gravitated to those books. I did, however, make sure that students read at least one book from every author so they had exposure to different styles and writing. Step 5: Rank the tournament seeds – After almost 2 weeks of working on the PB study, (we were also doing a read aloud at the time, so it took longer than I anticipated) students ranked their favorites 1 to however many they had read. I then created an excel sheet and awarded points to each book, depending on how students ranked them. This was tricky, and I am not sure if my methods were mathematically correct, but points were awarded as follows – 10 points for 1st through 8th, 5 points for 9th through 16th and 1 point for 17th through 24th. Step 6: Set up the bracket – I searched online for a free 24 team bracket that enabled editing and simply added the names of the books, printed it off and gave it to my student observer from a local college (who actually is a pre service social studies teacher!) 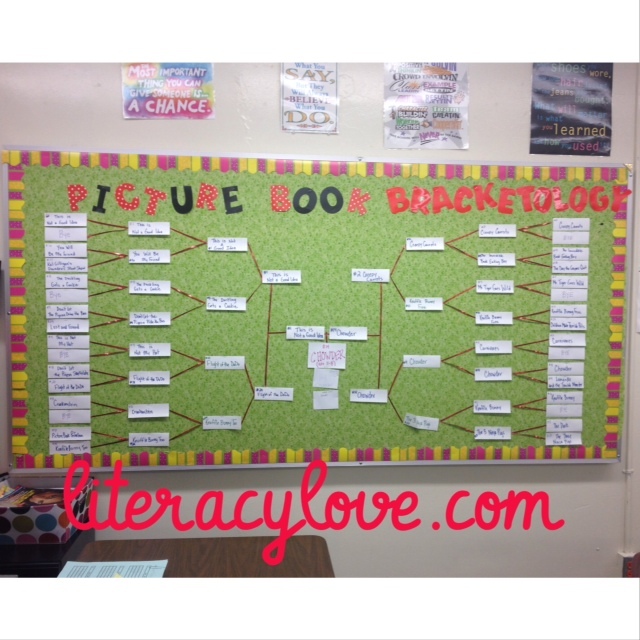 with the instructions “Can you make this on the bulletin board by my desk using materials in the room?” He was up for the challenge and did a fantastic job coming up with a giant bracket as you can see below. Step 7: Choose a winner – Before we started voting, students wrote down the book they thought would win the entire tournament on a notecard and I kept them until the very end to see how many of them chose correctly. Step 8: Fill out the brackets – With the bracket that I chose, the first 8 teams got a bye during the first round. This was perfect vocabulary for a teachable moment because some of the students didn’t know what a “bye” is and honestly, most needed a tutorial on how a bracketed tournament even works. I liked that some real world know how was spontaneously incorporated into this project by using a real bracket. I gave students their own copy to use as their voting ballot, and during each round we went through each match up and revisited the books one last time before they marked their favorite and I tallies the results. Lots of talking about texts happened and it was awesome! 8th grade boys arguing between Picture Day Perfection and Knuffle Bunny books was definitely a highlight. In the final round, our top seed This is Not a Good Idea by Mo Willems faced off against our dark horse #14 seed Chowder by Peter Brown and Chowder ended up winning by just a few votes. Two boys in the same class were the only ones who had chosen Chowder to go all the way and they received “Championship Ring Pops” for predicting the winner. I think all of the students that participated really learned a lot about what it takes to write and illustrate picture books and came away with a better appreciation for them. There was a whole lot of #booklove happening and it was fantastic! One last note – During the book study & tournament my classes of 6th and 7th graders kept a close eye on the bracket and were very interested in what the 8th grade classes were doing. What an amazing opportunity I now had in front of me! When they would ask me questions, I’d explain exactly how it worked, give them updates on each round, and offer to read one or two books, but “only if they wanted me to”. (Cue semi-evil reading teacher laugh) Of course that got them excited and they begged to be read to, especially my 6th graders, who wanted to read the entire “final four”. They then decided who they thought should win and were shocked (and a little distraught to tell you the truth) when This is Not a Good Idea lost. This was just an added bonus to an awesome project that will definitely be a tradition in room 213 from now on! Don Tilman is oddly charming and socially challenged. He’s a genetics professor who never met an experiment he didn’t like. He’s starts the Wife Project was hilarious and sometime disastrous results. I loved this quirky little book so much that when I was only a quarter in, I searched online to see if this had been optioned for a movie yet. And of course it has been because I think this will be a fantastic hit! Crossing my fingers for Bradley Cooper as Don. He would be absolutely perfect for this role! I was a little nervous when I started this one and was hoping it would live up to how good The City of Bones is and I actually found myself liking this one even more! Lots of action, angst and more Magnus Bane. This book reminds me of a little milder version of I Hunt Killers, and I really liked it. I was a little disappointed in who the “bad guy” was, but it still kept me guessing the whole time. This series has a lot of potential. Will definitely pick up the next book when it comes out. This may be my favorite NA book that I have read so far. This is the second book in the Losing It series and it was a pretty good read. I like Carmack’s style of writing and these characters. Bomb is STILL on my list to read but I would really like to get to the rest of these books this week. 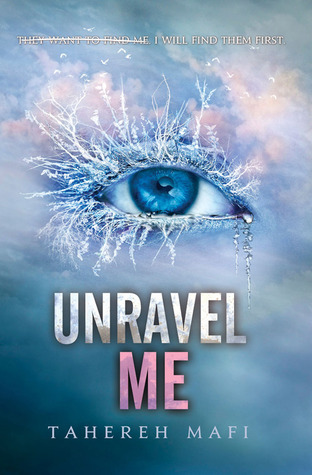 Shatter Me and Unravel Me (One of my favorite series EVER! Warner…. sigh) are rereads in anticipation for Ignite Me which comes out very, very soon and Why We Broke Up is my other Random Read for January. I can honestly say this week was a FANTASTIC seven days of reading! This week’s NA read was Lick, and while the title is a bit lackluster, the book is well written and has a great storyline. I mean who wouldn’t be able to stop reading a book from cover to cover – in two sittings – about a college student slash barista who wakes up in Vegas after celebrating her 21st birthday only to realize she got married to one of the hottest rock stars on the planet. I would read the rest of the series for sure. Fun read! I am a huge A.S. King fan and this book does not disappoint. It is about a seventeen year old boy whose family was on a reality TV show when he was five. You know, one of those shows where a fake nanny comes to save the family? Needless to say this particular family puts the “dys” in “dysfunctional” times infinity. Gerald is a character who you will want to root for despite all of his issues. Really hard to read in some spots but such a sweet coming of age story. When George Dawson learned to read he was 98 years old. This is his story of how he started picking cotton at age four and all of his adventures through his time on earth. Such a fantastic story about working hard, family and perseverance. Fascinating look at America during the twentieth century. This book was one of my Random Reads for January, which you can learn more about here. 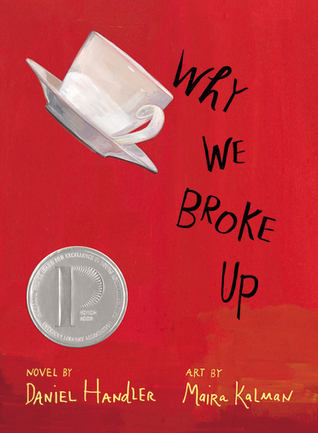 This book will be extremely popular when it comes out and I wouldn’t be surprised if it wins the Printz Award. I was really excited when I got approved to read the ARC on Net Galley and read it that night. All of it. In one sitting. This story centers around a very privileged and wealthy family that summers on their own island and four best friends. It’s about true love, an accident and a very, very big secret. I’ve never read something like this before and found it to be beautifully written and the ending will stick with me for a really long time. This is definitely a book where the cover sold me. I didn’t really know much about it when I requested it from the library, and I am happy to say that I absolutely loved it! This book, like the other YA books I read this week is about a teenager who is misunderstood, and is trying to fit in while surviving high school. I loved all the music references in the book and everything else about it. Great read! Not sure I will get to all of these titles with this week being the start of a new semester, but we’ll see how it goes. 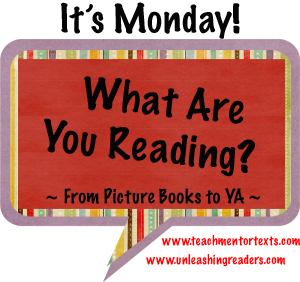 I feel like I am in a reading groove right now and don’t want to stop! Have a great week! Two snow days at the start of the week helped me get through some great titles!! I really, really liked this storyline and couldn’t put it down. I am definitely going to make an effort and read more of the series. The first two books in the Grisha Trilogy are my favorite fantasy books that I think I have ever read. I love the Russian inspired setting, all of the maps and unique places and elements of magic throughout. Bardugo is a master at writing characters. Sturmhond is one of the best out there, while the Darkling makes for one fantastic villain. Book three, Ruin and Rising, is scheduled to be released on June 3rd, and I cannot wait to see how this story ends. My third perfect rating of the week! I’ve always loved the Heist Society series and still think it would make a great TV show. This one is really centered around the meaning of family, and while I didn’t think it was as fun as Uncommon Criminals, I loved seeing what all of the characters got themselves into this go around. I hope there are more of these books. I’ve ventured into the genre of New Adult, readers. For those unsure what New Adult books are, I like to think of them as books with main characters that are college age or right out of college and are facing more mature life decisions than Young Adult characters. Or something like that. It’s still pretty blurry to me, honestly. Anyway, I got some NA recs from a fellow reader on Twitter and a blog that I follow and Losing It ended up being my first pick, based on Amazon reviews and price. A lot of NA ebooks are pretty reasonable which makes me feel a tiny bit less guilty about purchasing them. The storyline is about exactly what you think it’s about based on that cover and while it was pretty predictable, I thought it was an ok read. I read it in two sittings and would read another by this author. When I first read the original City of Ember way back when, I really enjoyed it. I thought it was different from other MG books and read the entire series. While I think this graphic novel version is pretty good overall, it does not go into nearly as much detail and background into the city and story as the original. But, I think it would be a great intro to science fiction for students that have never read any. I am going to read this version with my students next semester and have them compare it with the movie version and do all sorts of things with it. I do have the original book on CD too, so we can compare parts of that version as well. All of these books come very highly rated on Goodreads and Amazon. Life is So Good is my first Random Read for January (You can read more about Random Reads here), and the others are books I’ve been meaning to get to for some time. Bomb is a free copy I received in a Scholastic order, and the others are all library books. 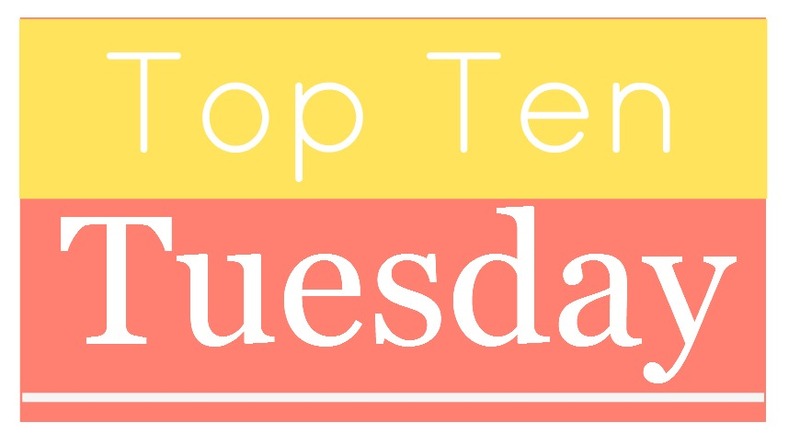 I’m on a major book buying freeze right now (Well…minus the PD book I bought last night) and have been requesting titles from my local library left and right! See you next week! Winter break is officially over, and while I didn’t get to every single book on my list, I got pretty darn close. Last week was another great reading week, and I can’t wait to go back to school and share these titles with my students. I am a big James Dashner fan and credit his Maze Runner series for helping me branch out to genres other than realistic fiction. This book, which is the first in the Morality Doctrine series, just didn’t really wow me. It took about 30 pages or so to really understand what was going on – gamers get involved in a cyber terrorist attack and are forced to go deep inside a game to save humanity – and I really thought the whole book was about 100 pages too long. Teens that are really into gaming and coding will like this one, even if it didn’t really work for me. I really enjoyed this book and its main character Callie. Callie was kidnapped by her mother ten years ago and has lived in horrible conditions ever since. When her mother is arrested after a traffic stop, Callie goes to live with her dad and his family in a small, greek influenced touristy town in Florida. I couldn’t put this one down. Really fun book that I reviewed last week. You can check out my review here. I love the Dairy Queen series so much and this book was a great ending to an excellent series! I am 75% finished with City of Bones and really enjoying it. I won’t have nearly as much reading time now that school has started again, but I am hoping I can get both Siege and Storm and Perfect Scoundrels read during independent reading time this week.